The first one is Lake #31. Lake #32 is built off its right edge ... continuing the scene. There is actually a more noticeable difference between them than is shown in these photos. #32 is more intense. 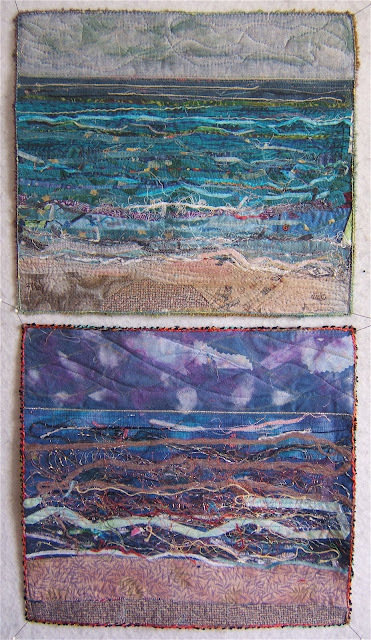 It's a challenge to make separate pieces with the intention of their being connected. It's easy to continue the lines, but difficult to get a suitable contrast between them. I have some thinking to do before continuing in this vein. I do like a challenge. Aargh! I copied small sized photos and positioned them side by side in the edit version. I'm sorry they don't show up that way here. Another "Aargh"!! 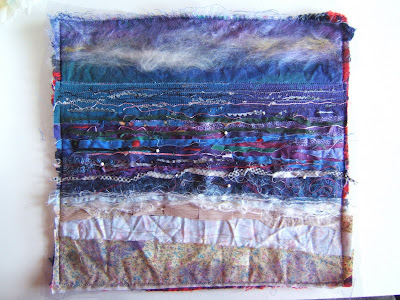 This piece was pinned together on the work table for two days. In all that time I didn't think to take a photo of it in progress. It occurred to me after the quilting was finished. Aargh! Thank all of you for the comments about our fun cottage furniture. There is one painted piece in our Tennessee condo. 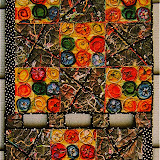 It's an art piece by Jan Miller, a funky tiered end table from the 1950's painted with lizards. 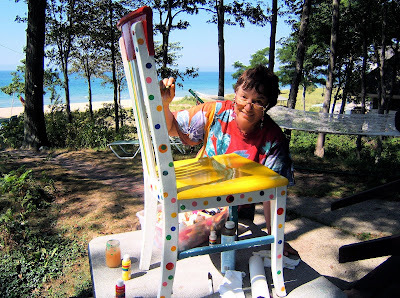 We have fun painted furniture here at Macatawa because this is a summer cottage. Most of the furniture is cast-off by previous generations of family or purchased at thrift or resale shops. It would be mighty dreary if these pieces were not jazzed up. 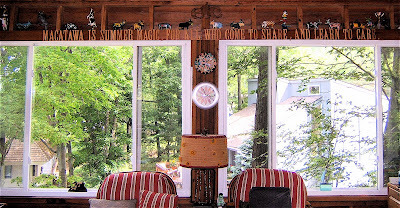 Besides, my husband and I want to present a fun summer retreat to our family and friends. This greets our visitors. It is hours of driving to get here from anywhere. Our sentiment is printed over the bank of windows in the livingroom. 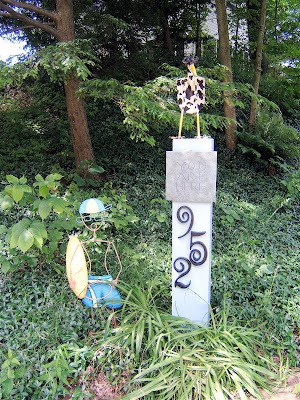 This place is filled inside and out with whimsy, humor, and art. We encourage all who come to play and create. 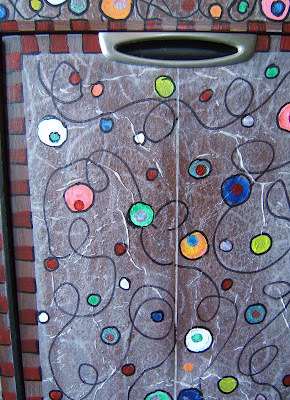 We are most pleased that our nephew, Peter, has honored us with a number of painted surfaces. 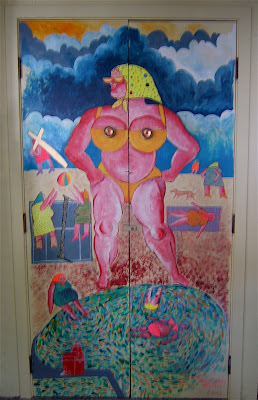 Here's the storage closet doors he painted just after he returned from years in Poland where he received his masters in art from the University in Warsaw. Then there are ongoing projects, such as this mirror. 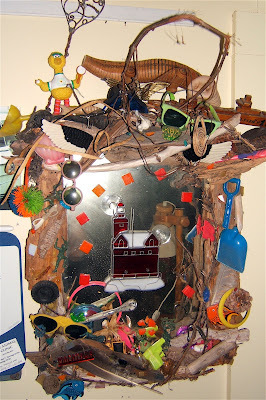 It is decorated with found, broken, or left over objects from projects. We consider ourselves to be this generations caretakers of a place that has been magical for so many people throughout the years. Our grandchildren are the fifth generation. 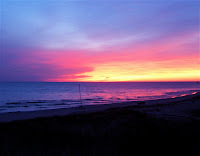 We invite you to view an album of photos about the cottage and our typical activities. It is posted in the sidebar. 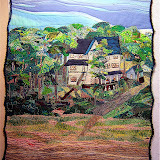 Just click on the photo of the cottage quilt. Pictures are worth a 1000 words. However, I've included captions. 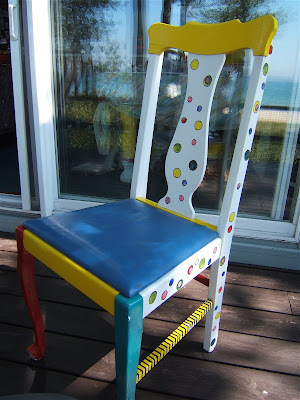 Several days ago Martha posted about a delightful piece of furniture painted by her sister. 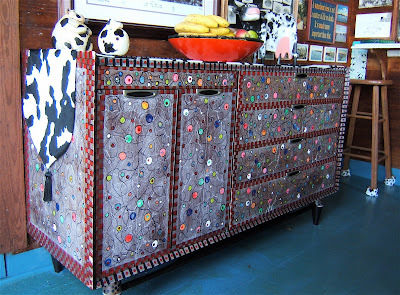 The polka dots prompted me to write about the sideboard in our cottage dining room. My friend, Alicia, and I painted it last summer. 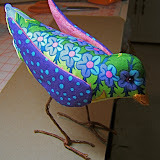 First we applied a hand-made paper and then had fun with acrylic paints, sponge brushes, and marking pens. In the fall I decided to add polka dots and stripes to the ten dining room chairs. 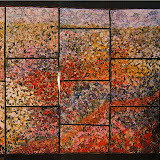 My husband, Lee, had painted parts of them various colors about 20 years ago. To view other pieces of furniture painted by Alicia and me in my studio go here. All the painted pieces are finished with two coats of acrylic medium. These photos were taken less than an hour ago. I noticed the sky was getting more beautiful and intense after the sun had gone down at 9:30. This first picture was taken through the trees as I walked down the stairs from the the livingroom. and then it kept getting more intense. 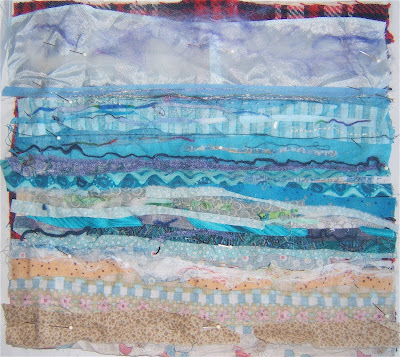 So, the many colors I put into my lake quilts are not so far fetched. It's the culmination of seeing hues like this on the lake for 40 plus years that I draw from within myself when making each quilt in this series. 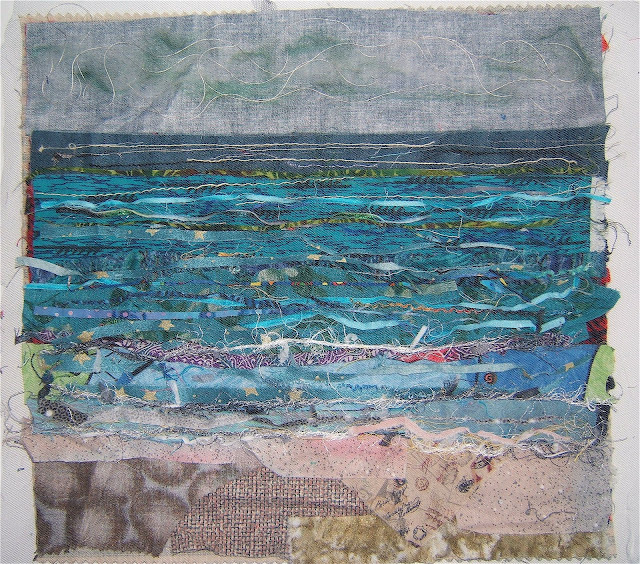 Today I made the first larger lake piece. 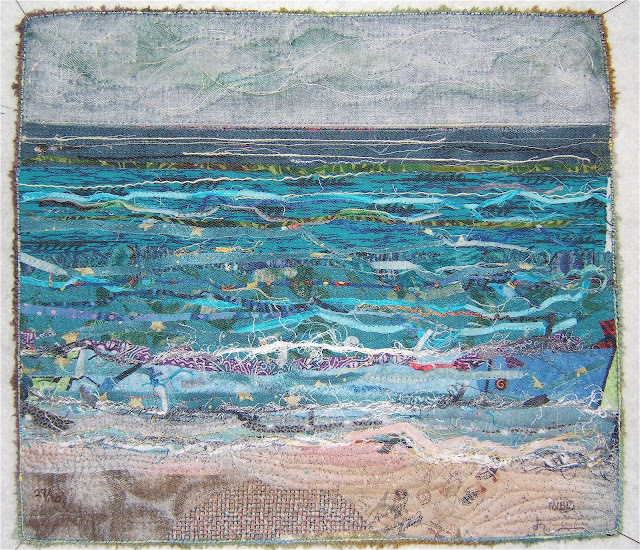 The next twenty in this lake series will be 17"x 14" instead of the 13"x 11" to 12" that are the size of the previous pieces in this ongoing to 100 series of lake quilts. 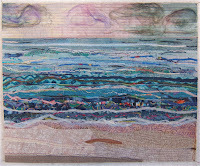 Lake #31 - 17"x 14"
Also, the horizons and shorelines will be the same distances from the top and bottom edges. I'm excited and interested to see what comes of these perimeters I've added for myself as well as for their possibly being combined in a larger art piece/installation. They are being trimmed to size, but not yet finished on the edges to give options in case I choose to attach some, or all of them together. For once I took a photo of a piece at the beginning of its construction. I begin at the horizon and lay down all the main pieces to cover the batt, which for these quilts are old blankets ... right now an army blanket. 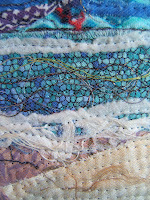 Then I churn through my bags to find just the right scrap, or ort, to fill in the details. I'm especially delighted if they're crumpled or wrinkled. 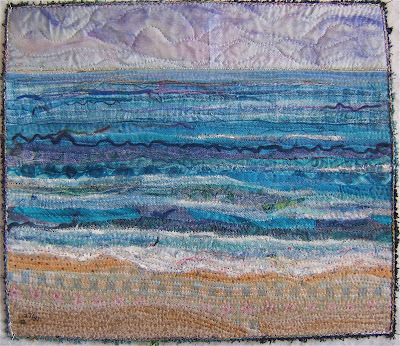 and a detail of the waves rolling onto the shore. I extend a special welcome to the more than 100 viewers from Hungary who have visited today. 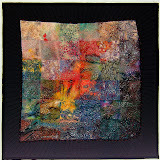 Thank you, Monika, for posting about my weblog in your quilter's chat room. This piece is close to what the lake has been like for this last week. The horizon has been almost indistinct and there have been undefined cloudy skies. I can't help but give the lake more reflected color than anyone can actually see. Knowing that light is filled with the spectrum of colors gives me creative license. Besides, I just can't resist ... can't help but do it. Lake #30 - 13"x 11.5"
There will be a change in the size and formating of at least the next twenty Lake pieces. Stay tuned. Jackson, my 8-year old grandson, made a lake piece. A couple of weeks ago he had collected "found stuff" throughout the day and had made an art piece "like his Granellie" does. He related this to me and displayed the piece in an iChat. I showed him the lake piece I had just completed that day and promised the next time he came to the cottage he could make one with me. Jackson very much liked digging through the bags of scraps. Every scrap appealed to him, but the blues and purples won out. 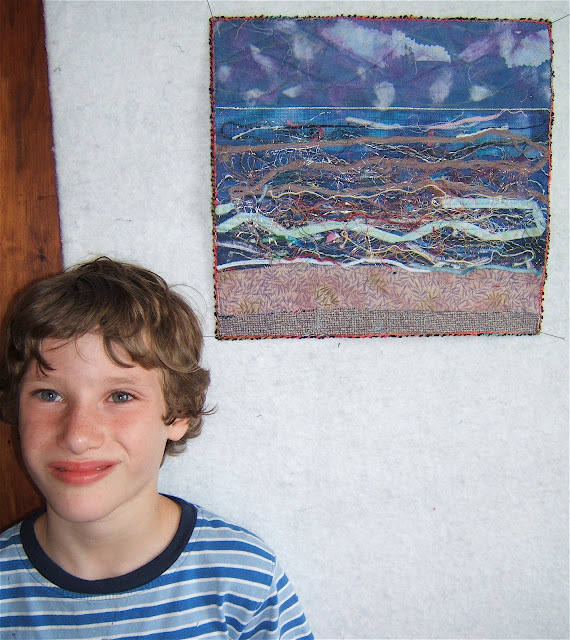 I'm showing him that small skinny scraps and pieces of yarn make good waves. 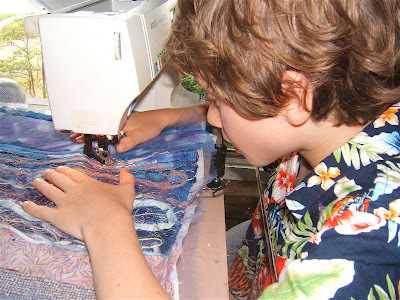 He was most pleased to finally get to sew on my best machine. The first few rows of quilting were done with my sitting right behind him at the machine. 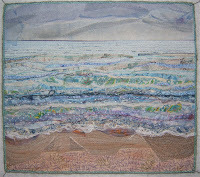 He did so well that I got up and did other things in the studio while he quilted. While Jackson was making his lake piece I was making mine. Here are Jackson's and my pieces hanging together on the design wall. 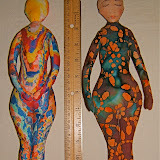 Both are 13" wide, but vary in height. 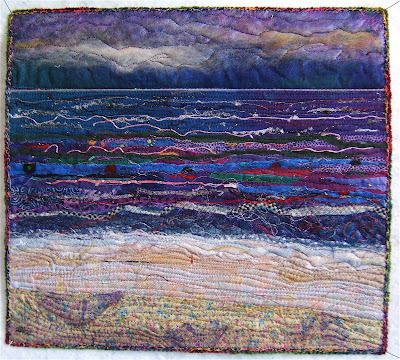 If you'd like to view the actual Lake Michigan,the basis of my "Lake Series", click here. It's the website for a webcam that posts a new picture every 30 seconds every day ... all year long. I've posted a permanent link in my sidebar that's located just above the Lake Series albums. Now you can see what I see, as well as what I'm looking at when a lake piece is being created here in Michigan. So far, that's numbers 27 and 28. I discovered this website last fall when the photo of a waterspout taken by that webcam appeared in the area newspapers. 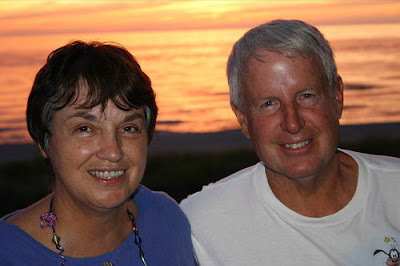 Thanks to all of you who left comments and suggestions about the changes to my blog appearance. 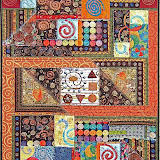 As a result, the newest changes are a larger scale "Nellie's Needles" header and a smaller scaled background of my "crinkle" quilt. 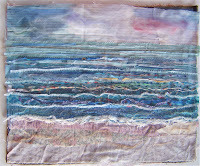 This version also shows up the piecing seams. The "comic book" photo of me didn't work so well in that small of a space. Phooey! Instead there's a pleasant photo of how I typically appear. Anyone who's been around when I'm reading, working on my laptop, or stitching will recognize those glasses and the chain. You can't help but notice the new look of this blog. I had been trying to get that interesting "comic book" shot of me on my blog. For some reason Blogger wouldn't allow me to change it out. Our younger son who is a Software Architect, as well as my personal "geek squad", is here for this week so I put him to work. 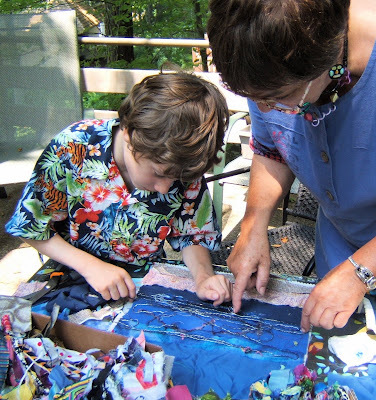 While he was at it, I had him paste in a background of one of my "crinkle" quilts. I got that idea after seeing the puzzle pieces background on Paula's blog. I love hers, but am trying to decide if mine is distracting. Please let me know what you think. 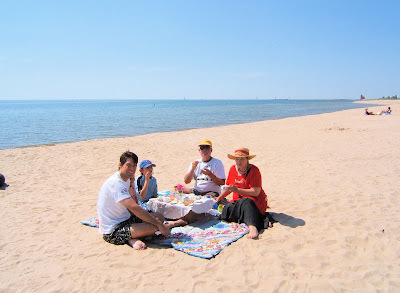 Tessa had a party at the beach for her family. 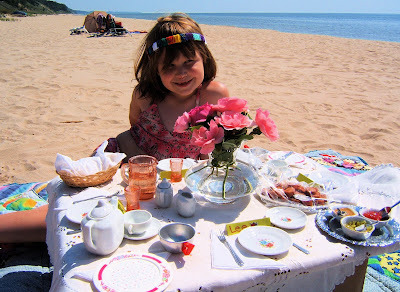 Real food was served on the complete set of porcelain doll dishes she had just gotten for her 6th birthday from Granellie. Invitations and envelopes were made. She and Granellie photographed her hand holding a rose. 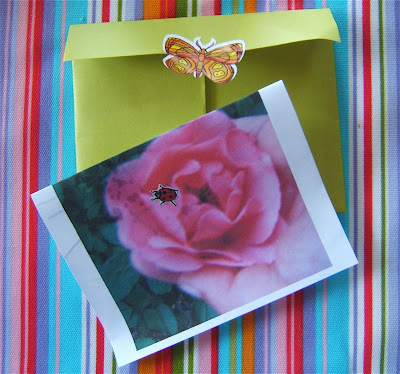 The picture was printed and decorated it with a ladybug sticker. 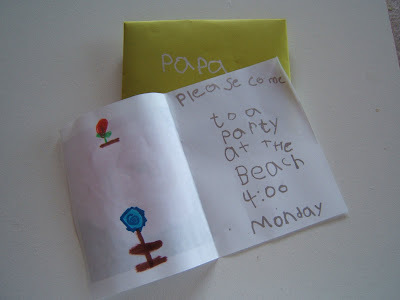 Each hand-written invitation was personilized by Tessa. The table is set and the hostess is awaiting the arrival of her guests. 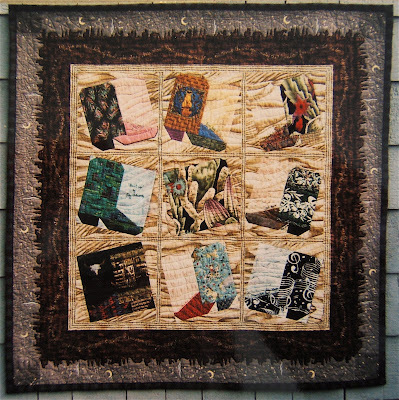 The cowboy boots were an exchange of blocks with my Thursday Bee of the Smoky Mountain Quilt Guild back in 2002. 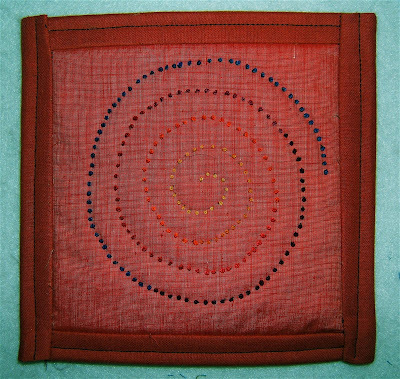 I'm remembering this wall hanging was made in 2004. All my paperwork is in Knoxville, so that's my best recollection. 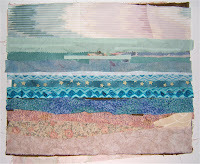 It was when I found the barbed wire fabric that I knew how these blocks were to be set and the title presented itself. 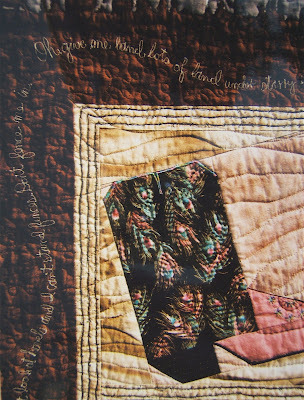 The lyrics to the song are machine embroidered around the border that features cowboys and campfires. My method is to write out the words on tissue paper with a thick tipped Sharpie pen. I then use a temporary spray adhesive to stick it wrong-side-up to the wrong side of the fabric. 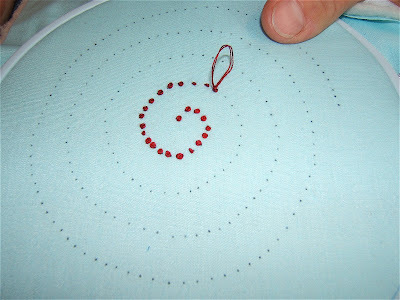 A fairly thick thread is wound on my bobbin and a finer one threaded on the machine. 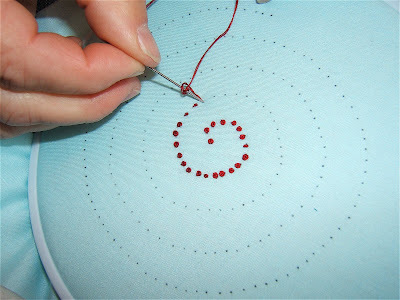 The stitching is done with free-motion embroidery from the wrong side. 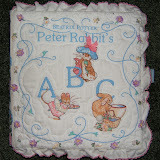 The thicker bobbin thread forms the words on the right side of the fabric. There's also a description and photos of my writing process in this posting. The wallhanging was gifted to my neice who lives in Texas. 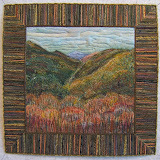 The barbed wire fabric was passed onto to Joyce for her farm critters quilt. 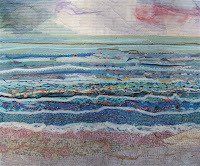 I'm excited about my latest Lake piece. I ended up depicting the lake on a moonlit night ... without the intention of doing so. Because I hadn't deliberately done so, it took a while to even recognize that time of day. It happened because I build off the first piece of fabric picked up. 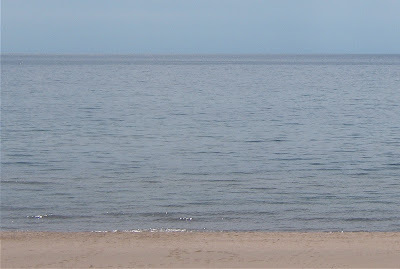 I begin at the horizon ... either the sky or lake. This one began with an interesting very dark shaded blue. I thought I was creating an approaching storm. But what happened with the clouds and the beach spoke otherwise. This kind of thing is what thrills me and keeps me at it ... especially after the struggle of making that first one in the presence of the lake. It's most interesting to have found that I kept my back to the view of it ... that I couldn't make myself look out the window. Last night I made the postcard size one for a friend who cut my hair this morning. It gets a half designation within the series. 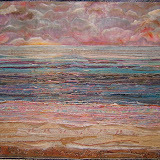 I had an appointment to introduce my Lake Series pieces to Good Goods gallery in Saugatuck this morning. Yippee!!!! They loved them and kept 12 out of the 26 made so far. It's been a few weeks since I've made any. Instead of unpacking more boxes or weeding I made one this afternoon. I've been curious how that would go when in the presence of the lake. I don't know if that was the factor that made putting this one together difficult, or if it's that I'm out of practice. Somehow, I couldn't look at the lake while constructing this piece. I kept my back to the window ... to this Here it is under construction. Part of the old stadium blanket that's used for the batting is visible at the top. It was fun choosing from new scrap bags. 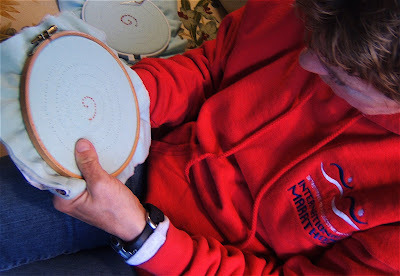 I'd forgotten there were so many orts from projects made here at the cottage. Reminiscing about each ones origin made me smile and feel excited about making future lake pieces. I ended up doing quite a bit of oil pastel work to blend the elements. In spite of the struggle, Lee claims it's his favorite (of the moment). 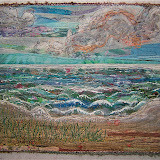 To view photos of previous pieces in this series, click on the album covers in the sidebar. 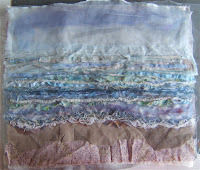 To read about the making of previous pieces click on the label, Lake Series. The knot that I'm using to stitch the spirals in the 6"quilts for the "...and still counting" project is the Colonial knot. 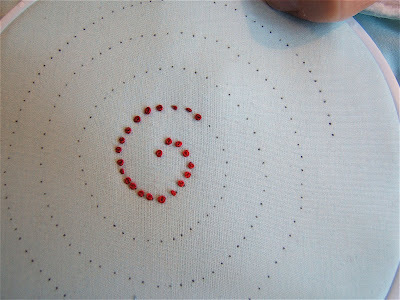 I prefer the Colonial over the French knot because it is more stable. Plus, it's fun to make. It's been taught it to everyone who I've lured into contributing to this project. My cousin-in-law, Judy, demonstrated the step-by-step technique for these photos this weekend just minutes after she had learned how to make them. Pull the 2-ply strand of floss to the surface where the knot is to be placed. 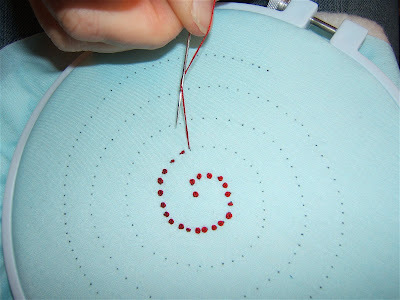 Lay the needle on top of the floss to make an "X". Note that the needle is pointed away from you. Dip the point of the needle under the floss. Wrap the floss over the top of the needle. 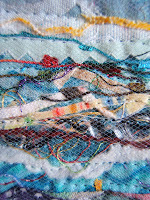 Insert the floss wrapped needle into the fabric about a threads width from where the knot began. 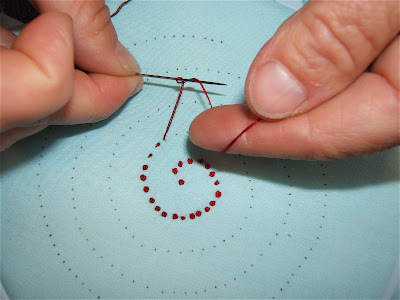 Pull the length of floss to tighten the knot around the shaft of the needle and snug it against the fabric. Pull the floss through to the back of the fabric to complete the knot. 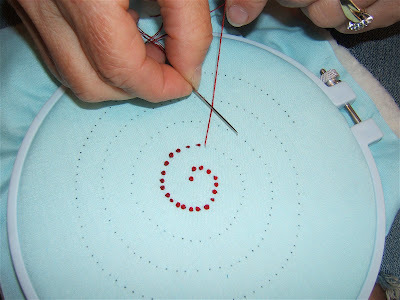 You have just made a figure eight with the floss around the needle to make the Colonial Knot. The Colonial Knot is used for Candle Wicking stitchery. 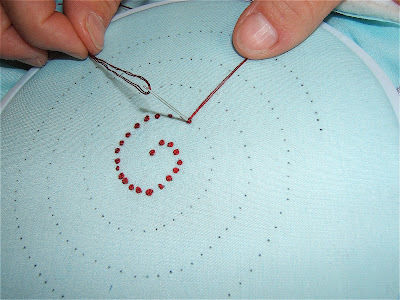 The size of the knot is determined by the thickness of the thread and the size of the needle. These were made with 2-ply strand of floss and size 7 needle. 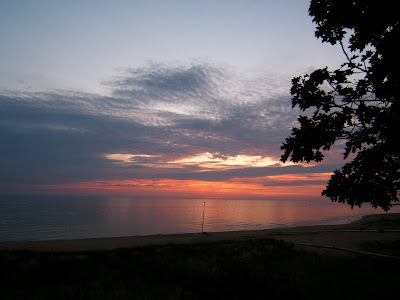 Here's a photo of our first of the season sunset over Lake Michigan. Is this more real than the art pieces created from within? The weekend was filled with lots of family and activities. The last crew left this evening. I'm crashing tomorrow.